A great Deal of the Day comes courtesy of Contessa. I am not familiar with their line of frozen entrees, but if the others are anything like the Shrimp & Orzo, they are on the right track! The frozen ingredients, in a stylish black plastic bowl, thaw into a fresh flavorful meal - the shrimp remain plump and tender, with a firm texture; the broccoli florets are large enough to retain some crunch (most of the time frozen broccoli is chopped to mush), and the orzo pasta is not overcooked - it is springy to the bite. The buttery garlic herb sauce is pungent with a pleasingly intense flavor; there is not a lot of sauce, but you can still actually taste the butter and garlic. The label photo shows the shrimp towering over the broccoli florets, truthfully it is the other way around, but the shrimp are larger than bay shrimp and taste like they were frozen fresh -- very good. My package only had three shrimp, but for 99.99 cents I am not complaining. Everything microwaves perfectly to the right temperature - so often a frozen entree has a hot spot where one ingredient is left half frozen when you bite into it. 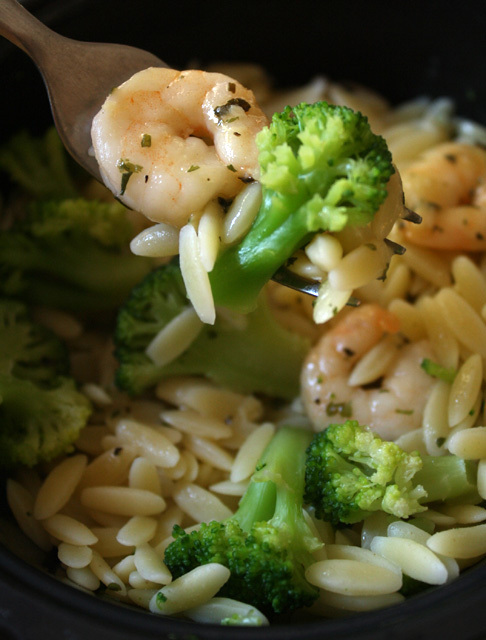 You do need to give this entree a quick stir to blend through the butter sauce. This delectable Deal of the Day is the right amount for a light meal. And I am brainstorming to come up with a homemade 99 Cent Chef version - I know not everyone will be fortunate enough to find it. 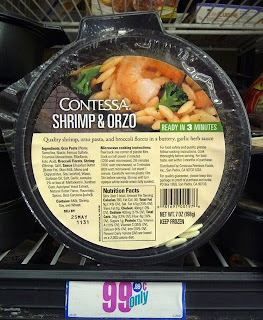 On a scale of 1 to 9, 9 being best, I give Contessa Shrimp & Orzo a perfect 9! Definitely pick up a few of these if you find them on sale, or from your local 99c only Store (I found mine at this location). This spicy breakfast taco will snap you out of a foggy-headed morning if you had a little too much cerveza the night before. If you want spicy, chili-infused scrambled eggs, as a tasty change to the typical boring breakfast, my Chorizo & Eggs Breakfast Tacos packs a lot of South of the Border flavor. Mexican chorizo is not cured dry like Spanish or Portuguese chorizo; it's more like a mushy ground sausage. Store bought, it comes in a plastic skin -- you just cut one end off and squeeze out the meat like toothpaste. Beef or pork comes uncooked but only takes a few minutes to brown and crisp up. 99c only Stores and Dollar Tree always seem to always carry it, and it comes cheap at Latin and regular grocery stores. 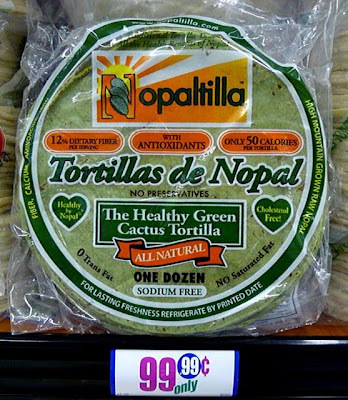 I usually make my tacos with corn tortillas, but I've noticed 99c only Stores sometimes stock green Tortillas de Nopal or cactus tortillas. The package states they are preservative-free, so I got some to try. They taste like regular corn tortillas, as cactus is a mild flavor, and the green color is fun. For my recipe, you can use regular corn or flour tortillas. 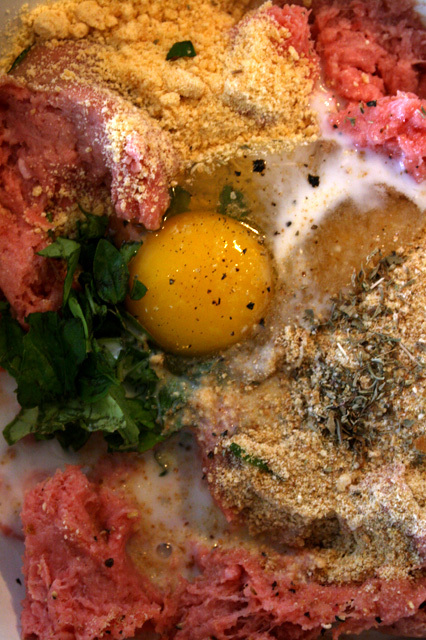 Chorizo and Eggs is also a tasty dish on its own. If you are lucky enough to have real Mexican taco trucks around (to see my taco truck video - click here ), try a Chorizo Taco sometime; they are under-appreciated. 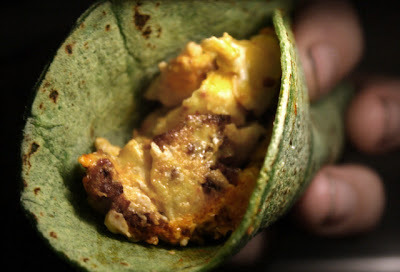 And in the meantime you can get spicy with my Chorizo & Eggs Breakfast Taco. 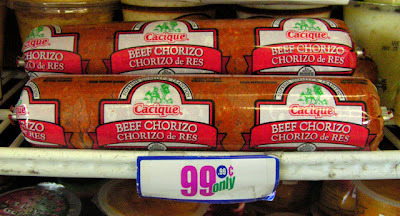 1 inch section of chorizo - and remove the plastic wrap! Oil for frying eggs, if needed - there is usually enough fat in the chorizo. Heat egg pan and add chorizo. Press out flat on the pan so it browns on one side for a few minutes. It will begin to break apart. Try not to let it crumble up too much. Since soy chorizo is vegan you are only heating it up and giving a little crunch to the normal soggy texture. You can start to heat up the tortillas over low heat in another pan or grill. When the chorizo has some brown crunchy bits, push it to the side of the pan and add your eggs - either directly to the pan or premixed any way you like them. 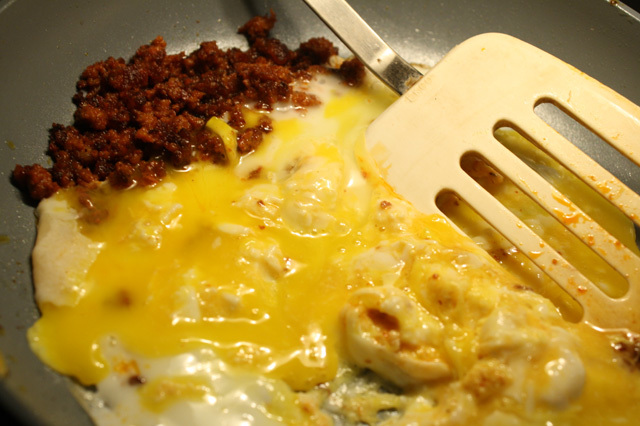 Once the eggs start to firm up after a minute, mix in the chorizo. 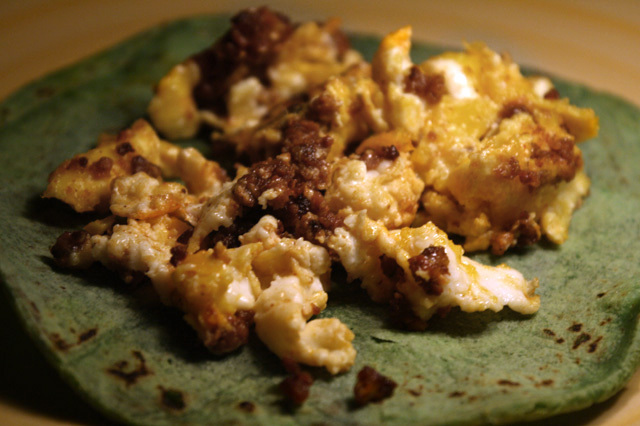 Serve chorizo and eggs in a warm tortilla -- plain or with salsa! 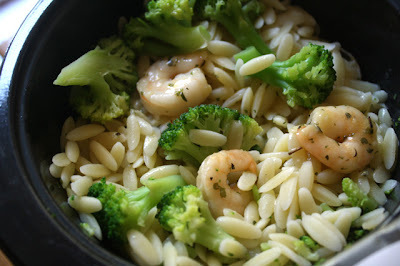 The most time consuming part of my latest recipe is cooking the rice. 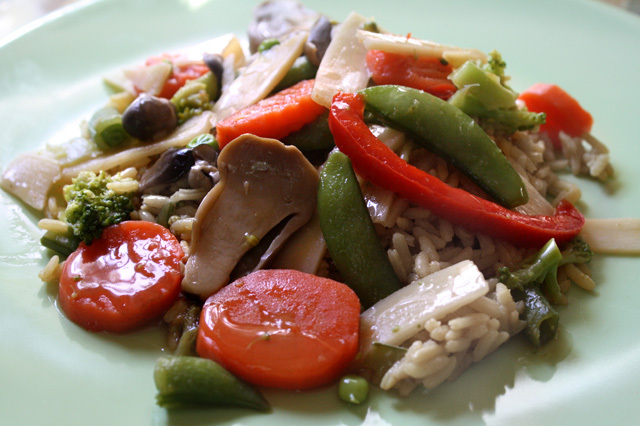 This vegetable stir fry is ready in about 10 minutes, using budget vegetables from the can and freezer. 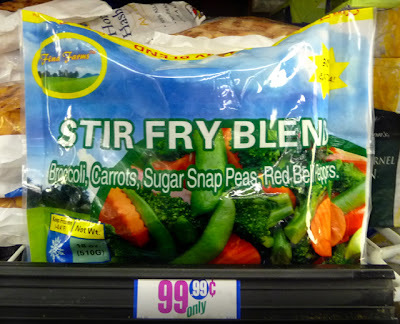 My local 99 cent Only Store is carrying an 18 ounce stir fry blend that includes snap peas, carrots, broccoli, peas and bell pepper. They taste surprisingly fresh when heated through. Of course you can use any frozen veggies on hand, even mixing a couple of blends. And cans of Chinese style veggies are always on sale. I am not a fan of canned or bottled mushrooms, but I like straw and shitake. 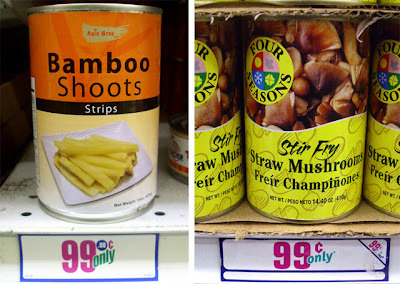 You should also try bamboo shoots from a can - they retain their crunch and are an unusual tasty addition. I've tried baby corn and water chestnuts, too. Just adding one of these gives a boring stir-fry an interesting texture, and deliciously exotic flavor. Lately, after another 50 work week, I just don't have time to shop for fresh vegetables then prep them for this healthy dish. So leave your cleaver in the knife drawer - you don't have to chop a thing for my easy and quick-to-make Cheap Chinese Vegetable Stir Fry. 1 package of frozen vegetables - I used an 18 ounce stir-fry blend. Okay to use any frozen veggies on sale. 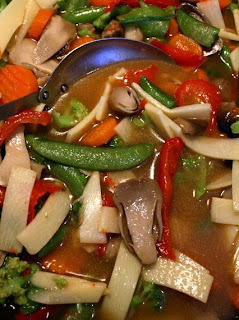 2 cans of drained Chinese vegetables - I used bamboo shoots and straw mushrooms. Other veggies to use include: baby corn, shitake mushrooms, bean sprouts and water chestnuts. 1 cup of broth - vegetable or chicken. 1 tablespoon of corn starch - okay to substitute flour. 1 tablespoon of soy sauce - no salt needed as soy sauce has plenty for me. In a heated wok or frying pan, add teaspoon of oil, frozen vegetables and drained canned Chinese veggies. 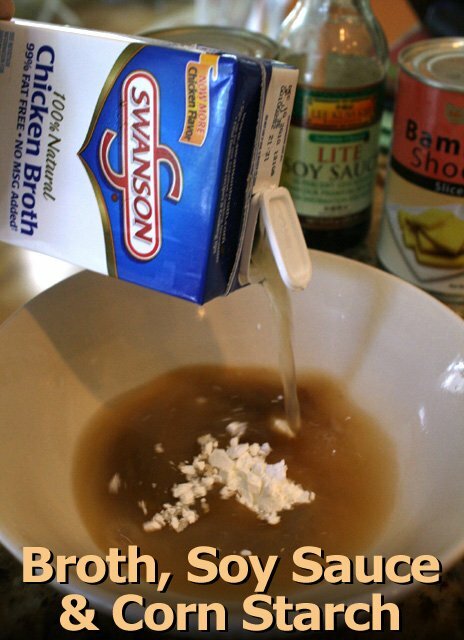 In a bowl add broth, soy sauce and stir in corn starch or flour. Mix well to dissolve. 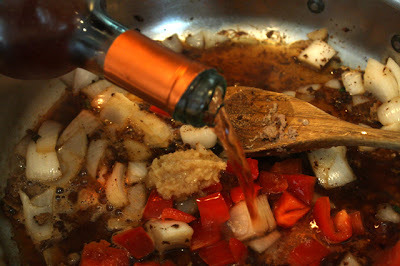 Pour sauce into wok of veggies. Stir well and bring to a low boil. The sauce will thicken in about 5-10 minutes. By this time veggies should be defrosted. Try one of the larger veggie pieces to make sure. Serve over cooked rice or ramen. 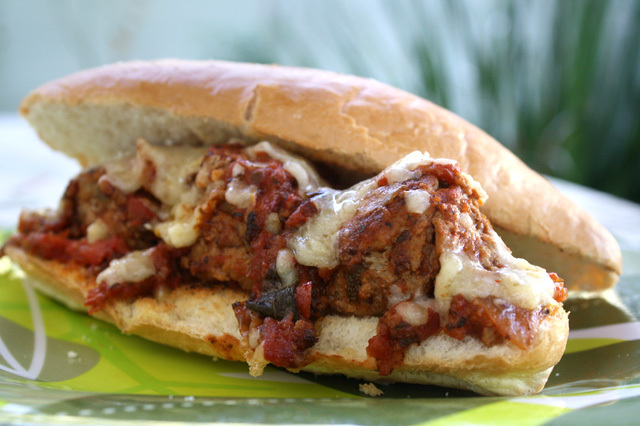 My latest recipe takes on a Bronx Italian Deli sandwich classic, the Meatball Sub. Forget about any other chef's recipe - mine whacks the competition, as theirs belong as buoys floating in the East River! Meatballs made of ground beef and pork sausage typically make for a heavy Italian meal, but I lighten things up by using budget-priced ground turkey. 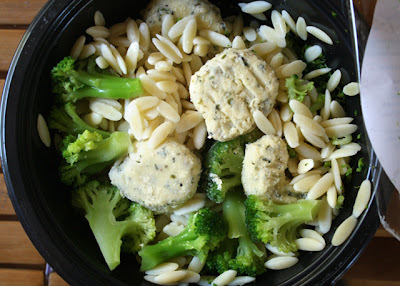 And I add plenty of flavor with Italian herbs and dried Parmesan cheese. We don't have many Italian Delis in L.A., but I am fortunate to be recently working near one, Bay Cities Italian Deli (click here), on 1517 Lincoln Boulevard in Santa Monica. It has an expansive deli case with all kinds of prepared pasta salads, cooked lasagna, and deli sandwiches made with fresh baked bread. The bread for my Meatball Sub uses a great 99c Only Store find -- the Mexican rolls called Bolillos. (Grill them one minute for a crunchy crust.) 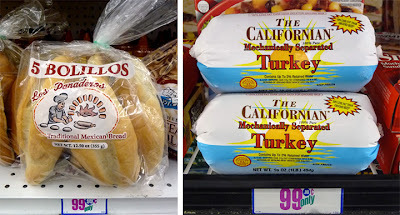 The 99c Only Store usually has one-pound tubes of ground turkey in the frozen deli case, and most regular groceries sell the same kind of ground turkey for just over a dollar. French rolls also make a good sandwich bread, but you can use any type of firm dinner rolls. 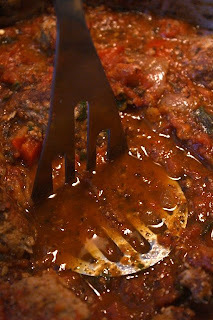 For this recipe, I make a tomato sauce from scratch, but you can use any favorite sauce from a jar, can or box. So try out The 99 Cent Chef's Meatball Sub - a recipe any NYC Italian mama would be proud to serve, and Buon appetito! 1 lb. 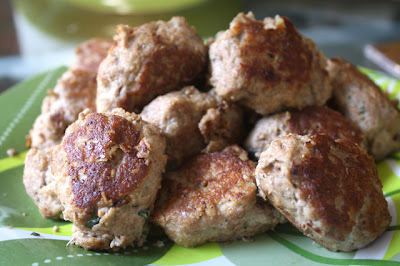 ground turkey - okay to use ground beef, pork, chicken, or any combination. 1/2 cup of bread crumbs - or crumble a slice of any bread you have on hand. 2 tbsp. of dried Parmesan - optional. 1 tbsp. total of dried Italian herbs - parsley, basil and/or oregano. I included fresh basil. Pepper to taste - I left out salt, as dried Parmesan has plenty for me. 1 tbsp. of oil for cooking. 4 bread rolls for sandwiches - Italian, Mexican, French or regular dinner rolls. I found 5 Mexican Bolillos rolls for 99.99 cents - which have an extra crunchy crust when grilled. Optional to add sliced or grated cheese for final sub assembly - provolone, mozzarella or any cheese you like. In a large pan add tablespoon of oil over medium heat. In a large bowl add ground turkey - pour off any liquid. Add the rest of the meatball ingredients. 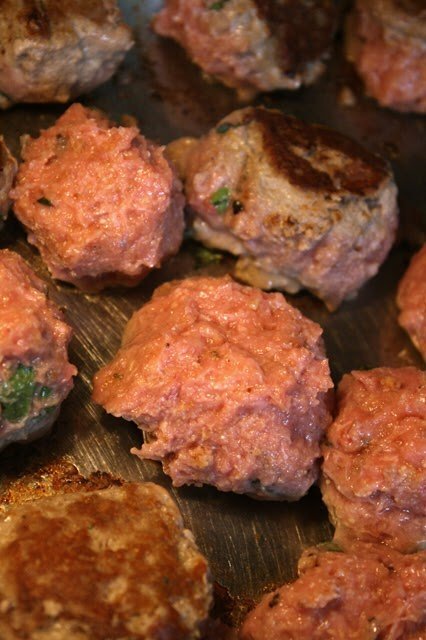 Mix well and form into two-inch balls (the meatball should not be too large or you will never wrap your mouth around the sub). Add each meatball to heated pan as you form it. Brown a couple sides of each meatball, about 15 minutes. Remove from pan and set aside after they are all browned - don't worry about cooking them all the way through, they will soon be simmering in tomato sauce. *1 large (about 1 lb., 12 ounce) can of tomato sauce - okay to use whole or chopped tomatoes. Any type that is on sale, and with any pre-added herbs and mushrooms. 1/2 cup of white or red wine - for extra flavor, optional. Okay to use a chicken or beef bouillon cube. 1 teaspoon of dried Italian herbs - including basil, parsley, and/or oregano. I used fresh garden basil and dried oregano. In the same pan you browned the meatballs in, add chopped onion, bell pepper and garlic. Pour in a splash of wine or some tomato sauce to scrape loose browned bits in the pan. Saute veggies until soft, about 5 minutes. Add all the tomato sauce and wine. Since I used canned diced tomatoes, about halfway through cooking I crushed the tomatoes and veggies with a potato masher, to make a smoother sauce. 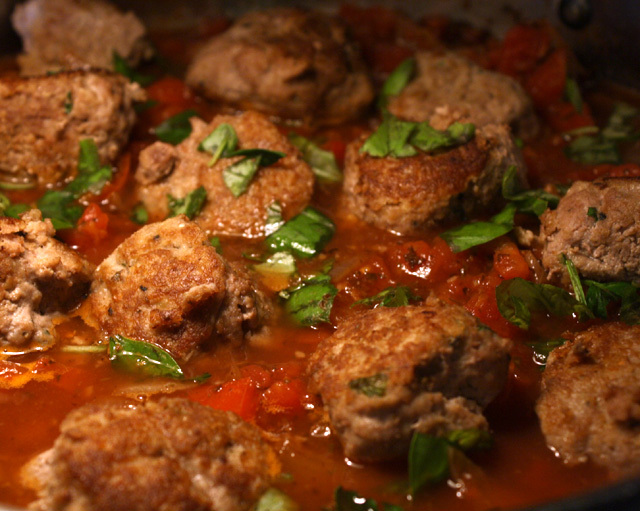 Add meatballs to tomato sauce, cover and cook over low heat for about half an hour. Uncover and cook until sauce is reduced by half and thickened, about another 10 minutes. *If you are doing a simple sauce without veggies, then cook canned tomato sauce with meatballs uncovered until sauce thickens, about 10-20 minutes. Turn off heat and let it cool for a couple of minutes -- so you don't burn yourself with the first bite! I like to toast the bread. Assemble the meatball sub: spread some tomato sauce on sliced (toasted) bun, add a few meatballs (I fit three per bun), and top with mozzarella (or any cheese). If you like extra melted cheese, then pop sandwich into a preheated 350 degree oven, or toaster oven, for a minute. This rich and creamy party appetizer is quick to do and can be prepared way ahead of time - and no cooking is involved! 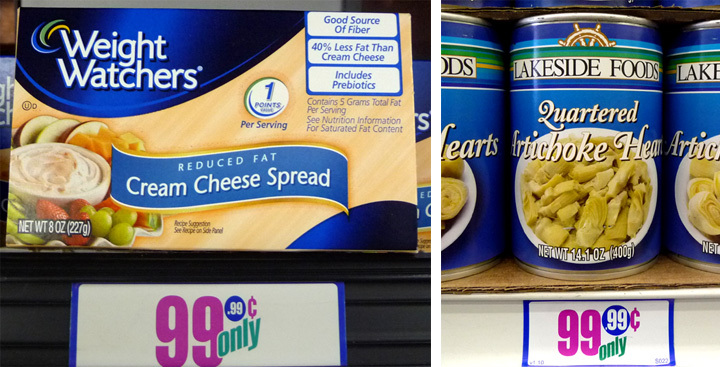 Most of the ingredients come from any well-stocked 99 cent ingredient pantry. 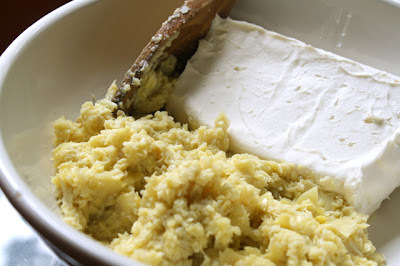 Most chefs will blanch and throw a hissy fit if forced to use 99 cent grated Parmesan from a plastic jar, but when combined with moist cream cheese and chopped artichoke hearts, this inexpensive cheese reconstitutes and gives an extra sharp kick to my party dip -- so don't worry, no one will know, unless you spill the beans! 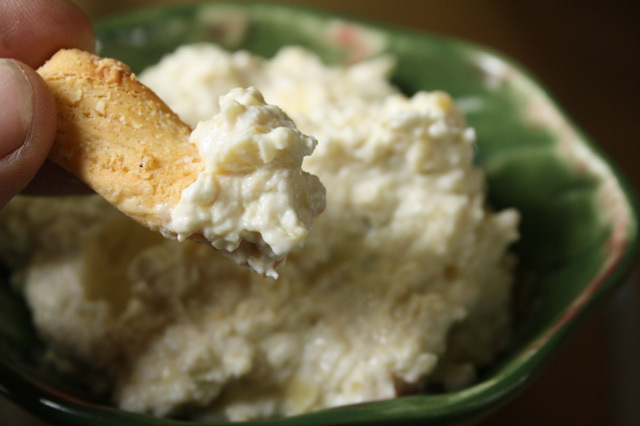 Allow a slab of cream cheese to soften in a bowl; add some chopped-up artichoke hearts from a can; sprinkle in some grated cheese from a plastic jar; and get out your favorite box of crackers for my delectable Artichoke Dip with Cream Cheese and Parmesan. 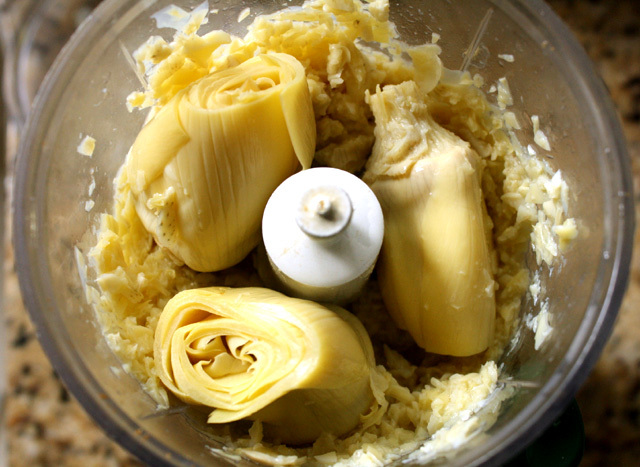 1 can or jar of artichoke hearts in water, drained - small or large size. 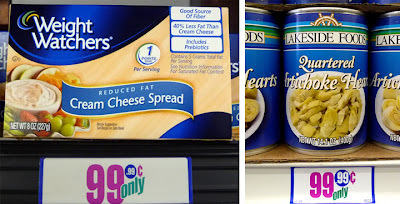 1 tub or package of cream cheese: 6-8 ounces. 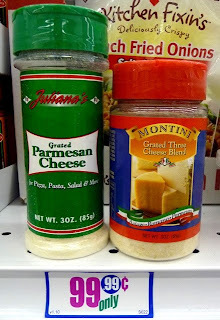 2-3 tablespoons of 99 cent grated cheese, including Parmesan, Romano, Pecorino, or any combination. Add cream cheese to a bowl and allow to soften at room temperature. Drain artichoke hearts of water (if marinated in oil or vinegar, this will overpower cheese flavor). Chop with knife or in a blender - both methods work well. Blend in chopped artichoke hearts and sprinkle in dried cheese. Mix well. Store in refrigerator until time to serve; and be sure to allow dip to reach room temperature again before serving. Set out with serving size sliced veggies (carrots, bell pepper, celery, etc. ), chips, or your favorite crackers. 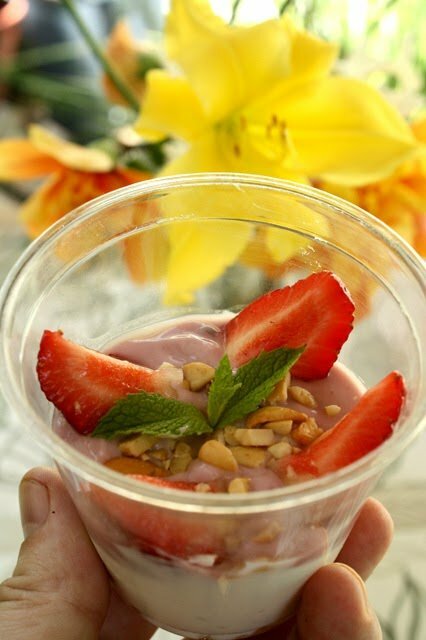 After a deliciously decadent month of hot dogs, this Chef needs a light, creamy and fruity break, and a Strawberry Parfait with Almonds and Honey is just what the dietitian ordered. Yogurt comes in many colors and flavors so I took the opportunity to mix a plain tart white Greek, and a fruity, sweet blueberry as the parfait base. To add some crunch I smashed up a handful of almonds (rinse and pat dry if they are salted). And honey really kicks up the flavor contrasts. All these ingredients come cheap. Yogurt is always on sale. You can substitute peanuts for the almonds; and use any fruit that is in season, or from your local roadside farmers market, including: peaches, pears, apricots, and berries. For the final hot days of summer try out The 99 Cent Chef's cool dessert that is a perfect finish to an outdoor BBQ. 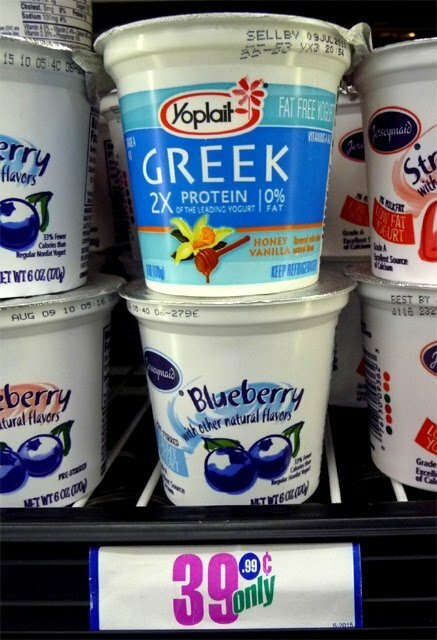 2 small containers of yogurt - pick contrasting flavors and colors. 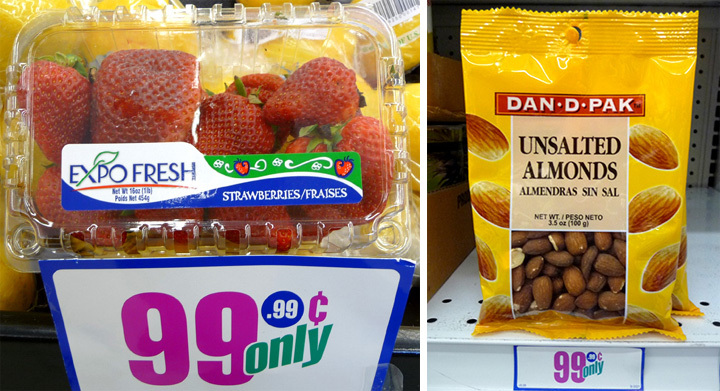 1 handful of nuts - almonds, or any type on sale. 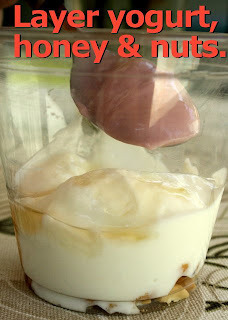 2 teaspoons of honey per parfait. 2 strawberries per parfait - sliced or halved. Okay to layer in as much as you like. If nuts are salted, rinse off with water and pat dry. Put nuts in a plastic bag (or between sheets of wax paper) and crush with a hammer or the end of a wooden spoon. Slice fruit into bite sizes. Assemble by layering yogurt, honey and nuts. Repeat until cup or parfait glass is almost full. Top with sliced fruit (you can also layer in fruit) - I had some garden mint that I used as a garnish.